Sturdy structure, magnetic brake mechanism, anti-slip footboards, front flywheel, intuitive operation. Medium resistance, multi-purpose use, moisture and sweat resistant. The Elliptical Trainer inSPORTline Oregon is an effective machine which can help you lose weight and strengthen your body. 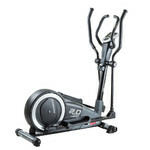 Since the flywheel is in the front of the machine, this elliptical trainer is smaller and thus easier to store (as it takes up less space). The magnetic brake mechanism allows for smooth and quiet running. There are 8 resistance modes which can be adjusted manually. You may also appreciate the easy-to-use computer and easy-to-read display, on which you can follow all the important information, such as time, speed, distance, calories burned, revolutions per minute (RPM), heart rate and odometer. The heart rate is measured through sensors that are built into the handles. 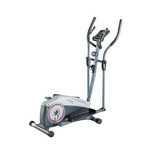 The anti-slip footboards and soft handles allow for a safe and comfortable workout. 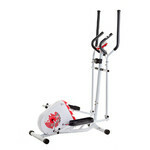 Moreover, this machine also features transportation wheels for easy carrying and an uneven surface adjustment system. 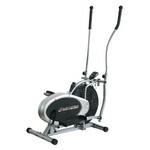 All of the above makes the Elliptical Trainer inSPORTline Oregon perfect for home workout.